I really like the design of this truck. 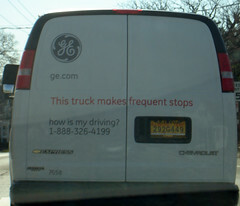 GE it appears thought of the out side of the truck as an opportunity to create a useful interface. The warning is right at eye level, and the driving comment number is clear and easy to read. The truck also does not carry an information that is time sensitive, like campaigns or advertising slogans. Well Done GE.